The launch of Invest Aberdeen at Marischal Square, Aberdeen. In the picture are from left: Allan McEwan, Cityfibre, Jim Gifford, Aberdeenshire council leader and Jenny Laing, Aberdeen council leader. Picture by Jim Irvine. Investors may soon be lining up to take advantage of opportunities in a growing north-east economy, council chiefs said yesterday. 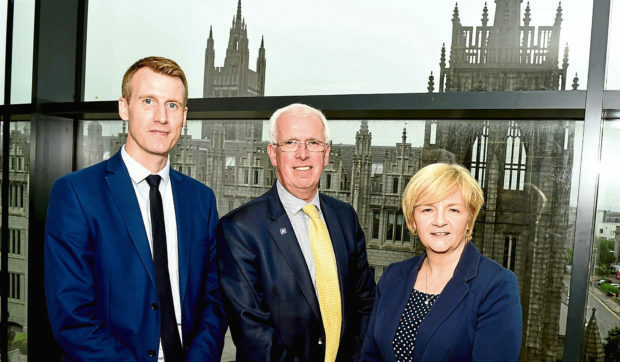 Aberdeen City Council co-leader Jenny Laing said a raft of infrastructure projects taking place in and around the Granite city were making the area attractive for potential financers. Aberdeenshire Council leader Jim Gifford added it was time for the region to “start blowing our own trumpet” as a new organisation seeks to secure fresh investment for the area. They were speaking at the official launch of Invest Aberdeen, which is intended to be a “one-stop-shop” for anyone exploring business opportunities in and around Europe’s oil and gas capital. Backed by both local authorities, the inward investment “hub” already has a five-strong team of full-time staff. Councillors Laing and Gifford said the timing was perfect, thanks to “the most significant transformation” in Aberdeen’s history as the new city bypass, harbour expansion, an airport upgrade and other major projects make progress. Allan McEwan, Aberdeen city development manager for fibre network specialist CityFibre, was at yesterday’s launch event at Marischal Square to highlight a £40 million investment in digital infrastructure alreadu under way. It will see Aberdeen become the first city in Scotland where nearly every home and business will have access to gigabit-speed broadband. Invest Aberdeen aims to raise the city’s profile in key markets, including at events such as next week’s Offshore Northern Seas conference and exhibition in Norway.